Root canal treatment, also called endodontic treatment, is a dental procedure to treat infection at the centre nerve of a tooth. The pulp inside a tooth is made up of soft tissue that includes nerves and blood vessels. Physical irritation caused by deep decay or a very large filling, severe gum disease, or trauma (such as a physical blow to a tooth or jaw) may traumatize the tooth, therefore requiring a root canal treatment. In root canal treatment, once the bacteria is removed, the root canal is filled and the tooth is sealed with amalgam, composite or crown. Most treatments can be completed in one dental session. Preventive dentistry is way of helping you keep a healthy mouth. The two main causes of tooth loss are decay and gum disease. Visit your dentist for regular examinations. Clean every surface of every tooth. Dr. Georgette Elias offers a variety of treatments designed to enhance your smile. In the event that you have a chipped or cracked tooth, Dr. Elias offers solutions that will correct the problem and give you the esthetic appeal you are looking for. For more permanent esthetic solutions, we offer porcelain and composite veneers. A veneer is a thin layer of restorative material placed over the tooth surface that protects a damaged tooth and enhances your smile. Dr. Elias will be able to recommend the required treatment for the best results. The removal of wisdom teeth, or third molars, is a common procedure. The wisdom teeth grow at the back of your gums and are the last teeth to come through. Most people have four wisdom teeth that usually grow through the gums during the late teens or early twenties. Because by this time, the other 28 adult teeth are usually in place, there isn’t always enough room in the mouth for the wisdom teeth to grow properly and they require extraction. Additionally, wisdom teeth that have become impacted or haven’t fully broken through the surface of the gum can cause dental problems. Food and bacteria can get trapped around the wisdom teeth, causing a build-up of plaque, which can lead to tooth decay, gum disease or other problems. 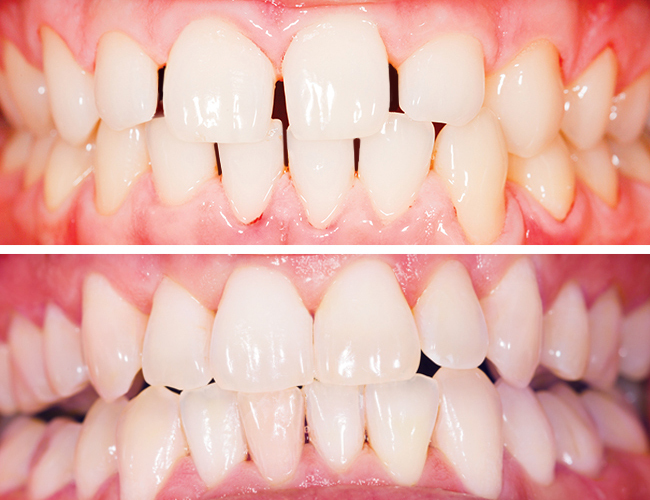 Teeth whitening can be a very effective way of lightening the natural color of your teeth without removing any of the tooth surface or damaging it. 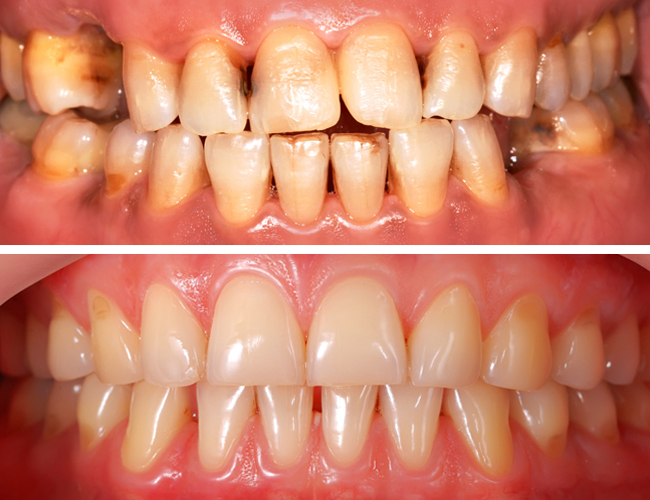 Usually the original shade of the tooth is whitened to a lighter color, rather than being turned completely white. As we get older our teeth get darker. This is partly due to our getting older, but it is also caused by the foods we eat and drink such as tea, coffee, colored juices, red wine and other foods that have strong color, not to mention the harmful effects from cigarettes. Teeth may also darken as a result of taking certain antibiotics at a young age. Try our teeth whitening laser or bleaching light treatment and bring back your smile in 1 session. PERIODONTITIS is a complicated form of (Gingivitis). Over time plaque will spread below the gum line therefore causing gum recession, bone loss and tooth movement. Dr. Georgette Elias practices gingivoplasty and dental curettage using a laser diode. 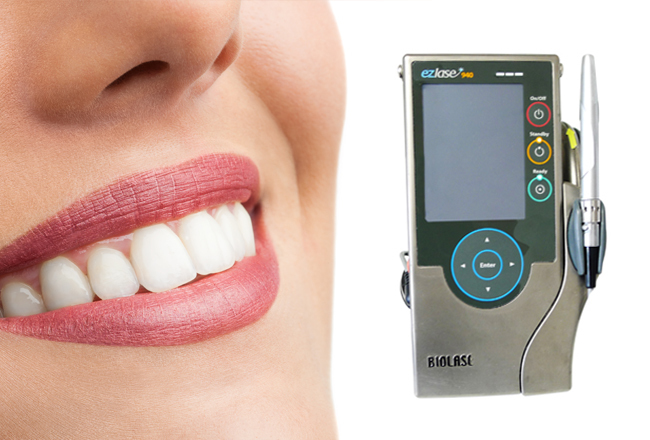 Laser diode dental curettage is a treatment that offers less pain, less bleeding and rapid healing. Both composite and porcelain veneers are great options to cover dental imperfections or close spaces between teeth. Porcelain veneers, however, allow for a more natural looking smile makeover. This is because porcelain has very similar light reflecting properties like the natural tooth enamel and the porcelain veneer is designed to mimic the characteristics of natural teeth. 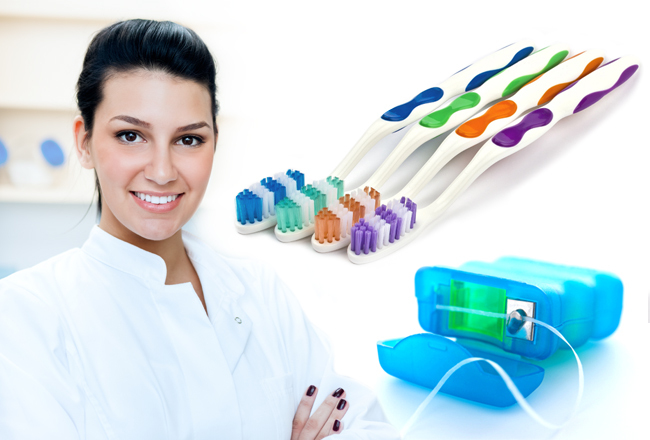 Therefore, it is easy to match the shade of veneered teeth with that of other natural teeth. High quality polished porcelain material is shiny and has a high resistance against color and stains. In turn, composite veneers absorb stains, which is a huge issue if you are a coffee and wine drinker or consume other stain-inducing foods. Bruxism is a medical term that describes the act of grinding the teeth and clenching the jaw. Bruxism is a common sleep disorder but also affects people when they are awake, which is more likely to be clenching of the teeth and jaw. Most people do it subconsciously while they are concentrating. Regular and persistent teeth grinding can cause pain and discomfort in your jaw causing headaches and wear down your teeth. 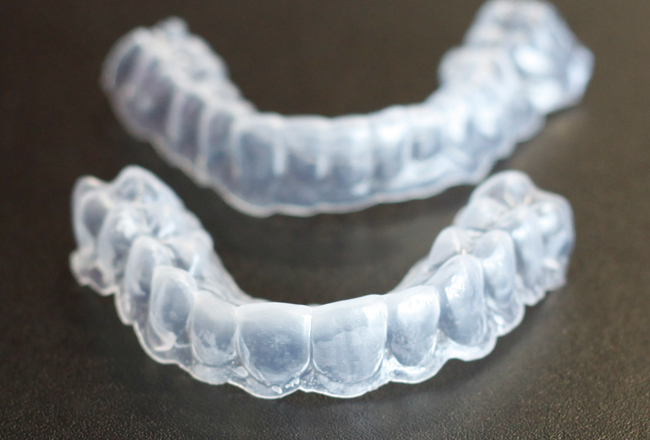 There are a number of possible treatments for teeth grinding but only a few, such as mouth guards have been shown to be effective. Partial dentures fill in the spaces created by missing teeth, settling partly on the gums and partially on the remaining teeth. Removable partial dentures may be secured to your natural teeth with metal clasps or precision attachments devices. Complete dentures replace all the missing teeth in a jaw and can be fitted directly on the gums and supporting bone as well as being attached to dental implants. An implant with crown is able to replace a lost tooth. The procedure consists of placing an implant on the bone and securing the crown over the metallic implant. A crown on a dental implant not only resembles the most to a natural tooth, it also helps preserve neighbouring teeth as well as stimulating the jawbone. 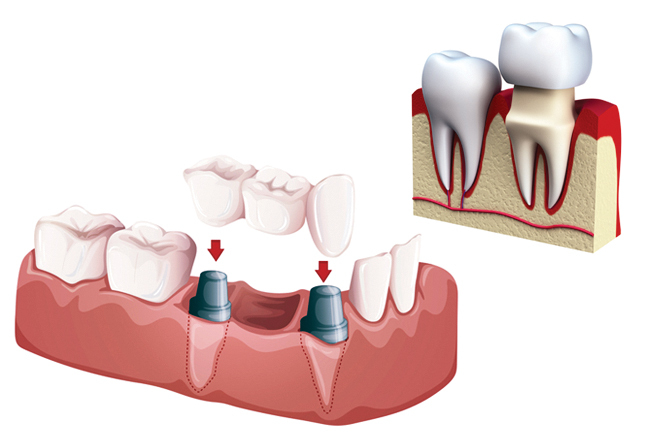 An implant with crown is a durable, comfortable and reliable solution that is able to replace one or many missing teeth.